In his new book “Digital Human“, Chris Skinner sets out a straightforward vision of the bank of the future. He says (I paraphrase slightly) that the back office is about analytics, the middle office is about APIs and the front office is moving to smart apps on smart devices. I was thinking about this in an open banking context, and it gave me an idea for a useful way to help people think about the impending change in retail financial services in general and retail banking in particular. 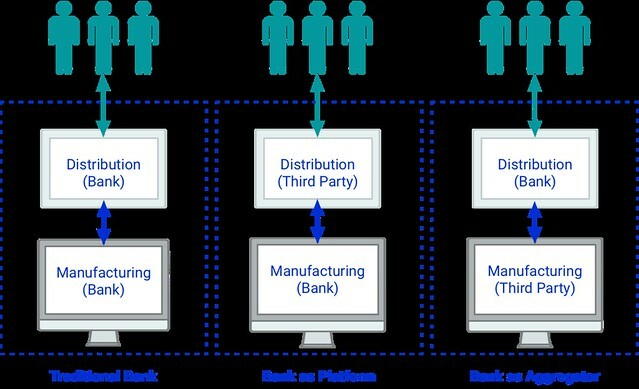 Let’s start from the traditional manufacturing/distribution model of retail banking that we are all familiar with and remember the broad economics of that model. 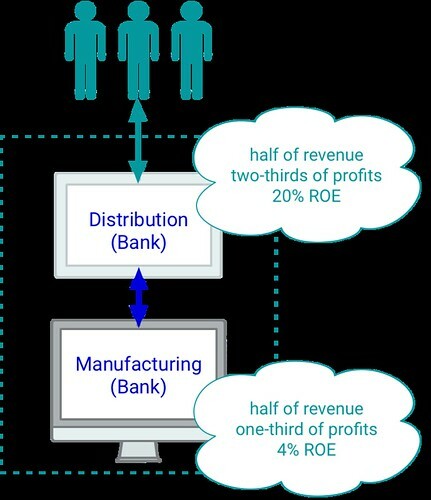 On a global basis (these are the McKinsey version of the figures, but others are similar), it is distribution that takes the lion’s share of the profits and makes the better return on equity (ROE). So now let’s rebuild that model for an open banking world using Chris’ back, middle and front office structure and think about the key technologies that will be transforming the businesses. I’ve invented the word “packaging” to describe the additional essential process that is needed to complete what we call the “Amazonisation” of banking, whereby products are manufactured as API services and distributed throughout the consumption of API services. This gives the three part model that Chris describes a practical technological backbone to make it work. What we don’t know, of course, is how this model will redistribute ROE. 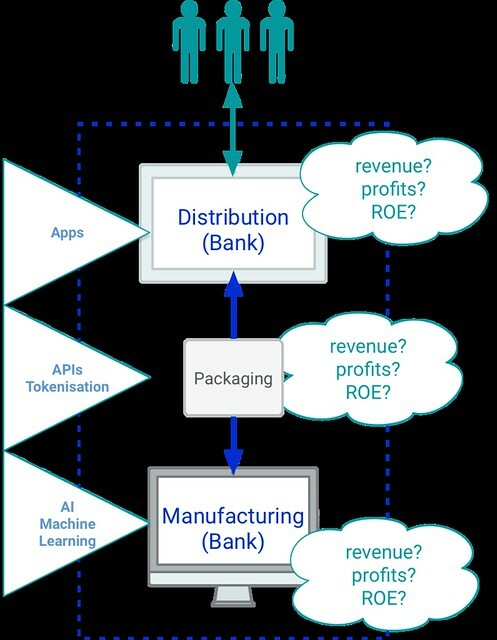 How will banks and “challenger banks” (we prefer the term “niche banks”), non-banks and neo-banks respond to the split of manufacturing and distribution that the new “packaging” layer (again, not sure if that’s the right term, I just couldn’t think of a better one) brings? That’s obviously a key question and one that is pretty important for organisations who are planning any kind of strategy around financial services in general or payments in particular. Since this includes many of our clients, we spend a lot of time thinking about this and the connection between technological choices that are being made now and the long-term strategic options for organisations. Consult Hyperion took part in a recent American Banker Open Banking “Bootcamp” (a two-part webinar) on the topic. My colleague Tim Richards and I were able to explore some of our ideas and draw on some of our practical experiences with bankers, suppliers and other practitioners. It was fun to take part in it and we really enjoyed it because we were able to learn as well as to share. I mention that webinar here because as part of the bootcamp, Mark Curran from CYBG (The Clydesdale Bank, Yorkshire Bank, “B” Bank Group and now also Virgin Money) set out a very clear high level view of the three strategic options available to retail. We think it’s useful to share them here: the “traditional” bank, the banks as a platform (think Starling) and the bank as an aggregator (think HSBC and Citi). If, as many people think, it turns out that ROE will remain higher in distribution then the commoditisation of the manufacturing function (as it turns into a “utility”) may well threaten some of the incumbents, because they will not be able to adjust the economics of their manufacturing operation quickly enough to stay in business! This may sound like a radical prediction, but it really is not. The reality for many banks will, of course, be more of a mixture of these approaches, but you can see the point. The decoupling of the manufacturing and distribution means that banks will have to make some important decisions about where to play, and soon. We’ve already seen how some banks (eg, HSBC) have moved to exploit the aggregator strategy and how some banks (eg, Starling) have moved to become platforms with rich app stores. But what we think may be under-appreciated is the extent to which the traditional bank can develop the packaging process not to shift to one of these strategies but to make itself more efficient and to improve the time-to-market for new products and services while keeping the costs of IT infrastructure under control. In other words, it makes sense for banks to amazonise themselves. I’m not sure the profit distribution in this industry will turn out to be like the classic McKinsey figures from industries where earnings are typically extracted from the end-user. ← Is 2018 the year of the #IDIoT?